Dilip Soman serves on the research sub-committee of the Financial Consumer Agency of Canada. He has received research funding from the Social Sciences and Humanities Research Council of Canada (SSHRC). What would you do if you spotted a wild animal in your proximity? If you know that inflation forecasts were one per cent lower than actuals and commodity bundles would cost two per cent more than expected, how much more should you save every year so that your retirement quality of life is not compromised? If you had quick answers to the first question but were not sure about the second, you are not alone! Several years ago, when our ancestors lived in rudimentary dwellings and had a barter economy, their decision-making primarily focused on questions like the first. As our society has evolved and our economy has become more complex, we have to deal increasingly with questions about debt repayments, retirement savings, budgeting, mortgages and lines of credit. And yet, the human brain has evolved over hundreds of years with the goal of survival. The more civilized and developed we have become, the more we are asking our brains and its associated apparatus to do what it was simply not designed to do. Financial capability is one domain in which the inadequacies of humans are particularly stark. Changes in the financial landscape over the past 20 years have taxed our cognitive capabilities to new levels. In the United States and elsewhere, the move to defined contribution pension plans rather than defined benefits has put citizens in the driver’s seat for making contribution and investment choices. Rising costs of education also require families to plan better. An increase in the number of options and complexity of financial products ranging from mortgages, loans, investment options and credit cards require citizens to be even more knowledgeable about their features. And easy access to credit means that citizens have to make decisions about allocating consumption over time — a relatively new skill that wasn’t needed in the pre-credit era. Finally, finance is non-intuitive to the human brain. Research has shown that people consistently fail to grasp the impact of compound interest or ongoing expenses on their wellbeing. In Canada, the news was equally dim. The 2010 recommendations of the Task Force on Financial Literacy, set up by the federal government, found that financial capability in Canada was no better than other countries. A total 31 per cent of Canadians were struggling to meet their bills and payments. The task force also found that the diversity in our country makes financial inclusion challenging. “Aboriginal Canadians,” “young adults,” “very recent immigrants” and “low-income and low-net-worth households” were the categories of people found to be struggling just to make ends meet. Over the past seven years, efforts in Canada and elsewhere have focused on improving financial literacy and helping citizens make better financial decisions. The Financial Consumer Agency of Canada (FCAC) has led the charge in creating a culture of a financially literate Canada. The news is encouraging — there have been demonstrated improvements in financial capability and Canadians seem less stressed about their finances. Yet, there is much work to be done. As the adage goes with any behavioural change challenge: It is relatively easy to make a change, but sustaining and growing the momentum are more difficult. In particular, efforts have currently focused on teaching Canadians critical skills at the right time. This includes efforts such as “just-in-time” financial literacy and guidelines or “rules-of-thumb” to make better choices. In the language of the behavioural sciences, these efforts are referred to as rebiasing efforts. Rebiasing simply refers to fighting one form of cognitive handicap with an intervention that may not necessarily fix the handicap. Giving people a rule of thumb to make better mortgage decisions doesn’t help them understand the theory of mortgages any better, it just helps them choose. On the other hand, debiasing refers to interventions that truly fix the handicap. When confronted with a mortgage, for instance, a debiased citizen might truly think in terms of interest rates, net present values and budgeting for payments rather than relying on a rule of thumb. It requires a fundamental mindset shift! It requires ongoing training and practice! What better place to change mindsets of future citizens than our schools and colleges? The Organisation for Economic Co-operation and Development (OECD) runs a program called the Programme for International Student Assessment (PISA). Since 2012, this program added financial literacy to its assessment of math, science and reading in 15 countries (including seven Canadian provinces). The measurement of these skills are essential — after all, it is difficult to impact something that can’t be measured. Critical to success in these initiatives is a curriculum that allows kids to make financial decisions and get feedback in a safe space. This can be done through a combination of traditional classroom activities, technology enabled games and some limited real world practice. Most Canadian provinces and territories embed financial literacy in their school curricula to some degree. The financial education children receive, however, varies significantly depending on where they live. British Columbia stands out: A new curriculum includes mandatory financial literacy instruction within math courses at every grade level, beginning in kindergarten. 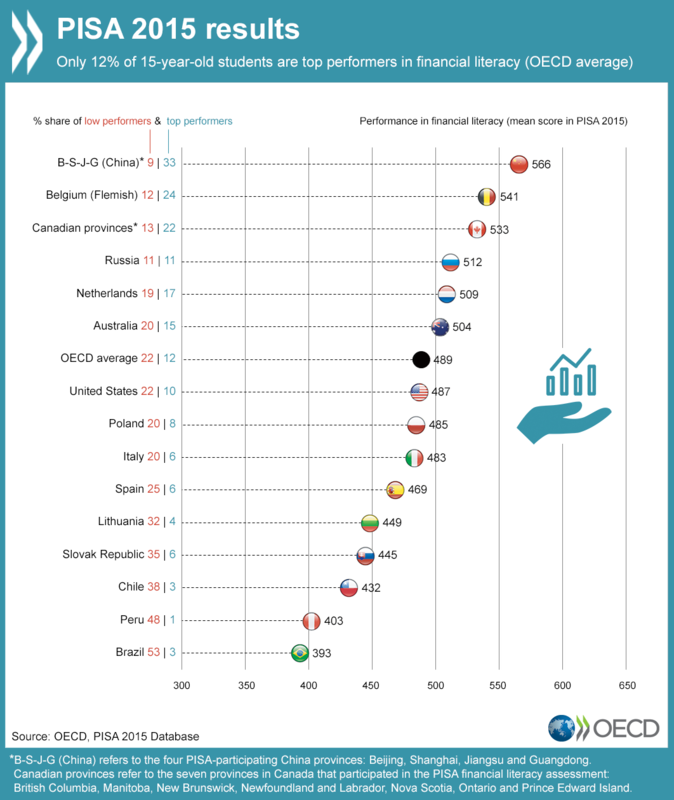 Results from PISA show that teaching financial capabilities in schools does have a significant and positive impact on financial decision-making by 15 year olds. The boost from school programs is especially significant in cases where there are high levels of parental involvement and when capabilities are developed through practice (either in simulated or real bank accounts) rather than through mere lectures. The study — which included data from seven Canadian provinces, and in which Canada ranked third, after China and Belgium — also shows that socio-economic status matters. It shows that while numeracy (being able to compute interest rates etc.) is important, it is definitely not sufficient. Being “street smart” about things such as recognizing that some deals really are too good to be true, understanding the role of income tax or being vigilant for fraudulent e-mails also play an important role in financial capability. Financial literacy for adults who need it now. Behaviourally-informed regulation that ensures a fair marketplace. A citizen base that acknowledges the centrality of financial capability to wellbeing and is trained to think financially. We have made inroads into the first two of these three blocks, and it is now time to tackle the third!